MGMaps - View maps from various sources on your mobile phone! Mobile GMaps is a FREE application that displays maps from Google Maps, Yahoo! Maps, Windows Live Local (MSN Virtual Earth), Ask.com, Open Street Map and other sources on Java J2ME-enabled mobile phones, PDAs and other devices. 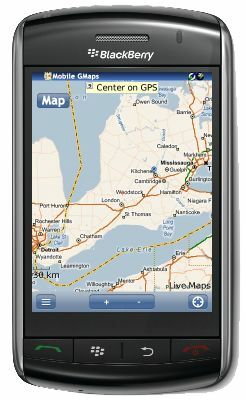 MGMaps can connect to a GPS receiver over bluetooth or use internal GPS features on some phones in order to automatically display the map for your current position. You can pre-download maps and store them on your memory card in order to use them on the go without accessing the internet. Mobile GMaps is distributed under the Attribution - NonCommercial - NoDerivs Creative Commons license. You may download, use and distribute the application free of charge only for personal, non-commercial purposes. Actually, MGMaps development stopped about two years ago... but never was announced on this new page. So here it is, I am no longer actively working on this project. There is a (tiny) chance the project will be revived and ported, but unless that happens you can consider the MGMaps project closed. I have thought of porting it to Android and/or iPhone, but the work and time needed for that outweigh possible benefits -- there are many apps that provide offline maps on both platforms (including the official Google Maps on Android). We're working to redesign this website and make it easier to find the information you need, until then please check the links below. /stored/ — Tutorial for stored maps by David Villeneuve. /winset/ — instructions to install Mobile GMaps on a Windows-Mobile smartphone or PDA / PocketPC. Please check the MGMaps forum for more up-to-date information. /kml/ — view maps from Windows Live, Yahoo and other sources in Google Earth. Help Center — configuration and usage instructions, frequently-asked questions, known problems, list of supported phones and operators and more. The instructions are a bit outdated, they were written for an older version of MGMaps - for new info check the forum. Feedback — Do you like MGMaps? Do you hate it? Have you found any bugs? Would you like a feature implemented? Do you have any questions not answered in the FAQ? — send a message and let me know! This website and the application are under permanent development, come back often to check for new versions.